There are plenty of mountains in the US, but the ones in Washington stand in a league of their own. From volcanic peaks like Mount Baker to the tricky technical climbs of Forbidden Peak, Washington’s mountains are as diverse as they are numbered. Many of these mountains are not for beginners, and some of them should really only be attempted by experts with a lot of experience in hiking and rock climbing, but one thing is for certain: Every single one of the mountains on this list is staggeringly gorgeous, with a view from the top that is simply unbelievable. As the tallest of the Olympic Mountain Range and one of the most isolated in Washington, Mount Olympus is a stunningly beautiful snow-capped mountain located inside Olympic National Park. This peak is very technically challenging, and is on the Triple Crown list of peaks, meaning it has at least 5,000 feet of prominence, 5,000 feet of elevation gain on the hike itself, and is on the Apex list of the most difficult mountains to climb. From the top of Mount Olympus, climbers will be rewarded for the struggles of the climb with a beautiful, 360° view. 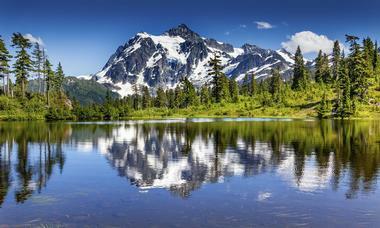 Mount Shuksan is one of the most beautiful mountains in the world, and one of the most commonly photographed. It has been included on lists of the greatest mountains in America, is one of the tallest peaks in Washington, and has a staggering 14 different routes to the top. 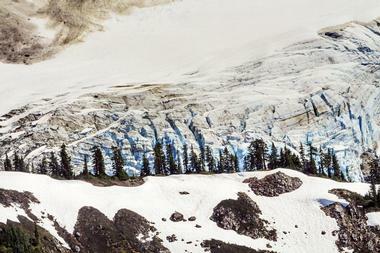 This is a long trip, so hikers should prepare to stay overnight while tackling Mount Shuksan. The routes are many and varied, but this means that potential mountaineers can choose the level of difficulty they prefer, from a Class 3 scramble to 50-degree snow and ice on the rarely traveled north face of the mountain. On a clear day, which happens more rarely than one might think, residents of the city of Seattle can see Mount Baker from the downtown area. This active but glaciated volcano is the third tallest peak in Washington, with 10,778 feet of elevation at its summit, record amounts of snowfall each year, and over 24,000 acres of glaciers. This constant ice presence means that Baker is home to some nasty crevasses, which can prove to be dangerous, but in spite of this, Mount Baker is actually a very nice peak for beginners to climb. 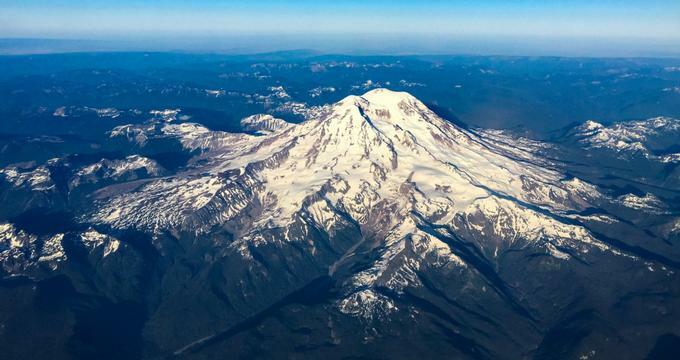 There are five volcanoes in Washington State and Glacier Peak is one of them. Glacier Peak is very seldom climbed because it is hidden from view, and also because years of storms and flooding have washed away any and all access roads, so conquering Glacier Peak requires a hike of at least 10 miles to even reach its base. With a bare minimum of 3 days and 8,000 feet elevation gain, climbing Glacier Peak is not necessarily the most technical or difficult climb on this list, but it is a very long and strenuous one simply because of the length and accessibility. Summiting Eldorado Peak, located in North Cascades National Park, is more than just cresting a hill. The summit of this jagged mountain is also one of the most famous knife edge ridges in Washington State, and the adrenaline rush from carving out a trail that’s just wide enough for two feet along the peaked snowy edge of the summit is much of the reason that people enjoy climbing this mountain. 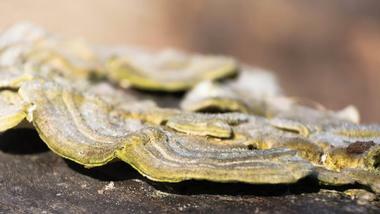 This quality gives Eldorado Peak a beautiful shape from a distance, a shape that has an almost Himalayan feel to it. A round trip to the summit and back takes about 1-2 days and is about 8 miles long, with an elevation gain of 7,000 feet. The view from the top of Sahale Mountain affords a look into the very heart of the North Cascade Mountains, at Eldorado Peak, Boston Peak, Sharkfin Tower, Johannesburg Mountain, and more. There is quite a short climbing season due to the nearly year-round snowfall, and the round trip distance to the summit is about 14 miles. Sahale Mountain is also easy to pair with Boston Peak, since the summit of that mountain is less than a mile away, and this will turn the hike from a half-day endeavor into a full or two-day trip. Dragontail Peak was named for the sharp, thin ridges of rock that extend along the southwest ridge of the mountain. The number of routes to the top of Dragontail Peak is staggering and huge, with such a variety of routes that an amateur could scramble to the top and a seasoned mountaineer could still encounter routes and cliffs they would find challenging. The approaches come from either Colchuck Lake or Snow Lake, with stunning views both from the base at these lakes and from the top of the mountain as well. Sherman Peak is technically a part of Mount Baker, located on the volcano’s southern edge. From the peak of this mountain there are views of Mount Baker and the rim of its crater, Mount Shuksan, and the Black Buttes. It’s an easy mountain to conquer and is accessible via a number of well-used routes, none of which require technical climbing ability. Sherman can be easily climbed in a single day, but it is recommended to split it into two so that the beauty of the surrounding nature can be fully appreciated. 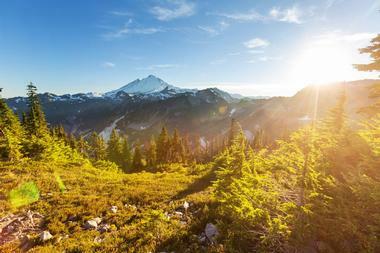 A trip to Sherman can also be combined with a journey to the summit of nearby Mount Baker as well. Lost Peak lies near Lost River Gorge, a gorge so remote that few humans have ever set foot within it, and there are no trails through that thick wilderness. The mountain that rises above the gorge is more accessible, although it is not terribly popular and is never crowded. Lost Peak is quite easy to summit; it requires no climbing equipment besides a sturdy pair of shoes and a resolved mind (although the trip may take more than one day), and the true reward of this mountain is not the hike itself, it’s the views from the top. Once there, it is possible to see the gorge, and a beautiful skyline of mountains set against the blue of the sky. Big Snow Mountain lies in the wilderness of the Alpine Lakes, and on the north side, this mountain maintains snow for most of the summer season in the deep slabs of glacially scarred rock on the north face. A trip to the summit of Big Snow can be achieved via some technical climbing above Hardscrabble Lake or via the Hardscrabble Trail, which is the easiest of the options but at 25 miles round trip, is quite long. Hikers can also use the Dingford Route, which is much shorter but involves a lot more technical knowledge and bushwhacking. Hidden away in the Cascade Valley, Forbidden Peak was previously referred to as Mount Forgotten and Isosceles Peak before the moniker of Forbidden Peak finally stuck. This mountain, with its picturesque triangular summit, contains a number of challenging routes for climbers, who must have a certain level of comfort with technical climbing before attempting this peak. With several different routes to the top, none of them are considered easy, as each involves not only hiking but also scrambling and rock climbing, but the views from Forbidden Peak’s loft summit make all the trouble worthwhile in the end. Mount Pilchuck, which is not located very far from Seattle, is one of the most popular hiking destinations for would-be mountaineers in Washington. Its status as an old lookout point means that it has spectacular views, both above and below the clouds. The opportunity to hike this mountain is often used as a stepping stone for beginner hikers to get their footing on a mountain, see some amazing views without a massive amount of exertion, and experience the summit of a truly beautiful mountain. The mountain is located within Mount Pilchuck State Park and requires a permit to enter or camp upon its grounds. Davis Peak has many summits, and which one is the highest has long been a topic of debate. The only way to really be sure that Davis Peak has been summitted is to make sure to hit all of them. The four main peaks each offer different sightseeing opportunities, and the approach to the summit follows a pretty straightforward ridge to the top. Davis Peak used to be a lookout site, so the view from the top offers some amazing views into the surrounding area, including towards Terrance and Opal Lakes. The Davis Peak Trail also offers the easiest ascent to nearby Goat Mountain; the two are easy to combine into one trip. Abercrombie Mountain is quite a popular peak to climb, both because of its prominence (just over 5,100 feet), and the fact that it does not require any technical climbing to reach the top, making this mountain accessible for beginner peak baggers looking to add to their repertoire. From the summit of Abercrombie Mountain, visitors have the option to continue on to Hooknose Mountain or simply view the valley and the Selkirk Mountain Range behind it. Hikers on Abercrombie Mountain should take care to watch for grizzly bears and prepare accordingly. 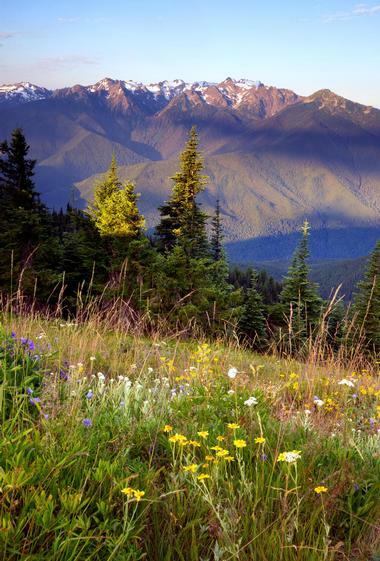 On the eastern border of Olympic National Park is Warrior Peak, a tall, rocky mountain framed at its base by green, forested slopes. 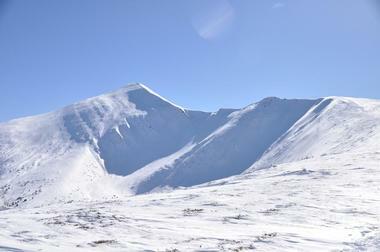 It is a double summited peak, with the southeast summit being about 15 feet higher than the northwest peak. Warrior Peak is quite remote, with several approaches to the top, and the shortest of these is 10 miles one way, which means that any excursion to this mountain should be done over at least two days. The three main approaches to Warrior Peak include the Upper Dungeness Trail, the Upper Big Quilcene Trail, and the Tubal Cain Trail. Tower Mountain is not the most popular peak to climb in its region, due to its imposing appearance and in particular the intimidating tower of rock that stretches up at its peak. The exposed granite at the top affords views into the North Cascades and the Glacier Peak region. On one side, the summit can be reached by a relatively easy Class 3 climb, but on the other side the wall of rock is nearly vertical and requires a level of technical finesse. The shortest route to the summit is 10 miles, and the longest route is 23 miles long, although the shorter routes require more bushwhacking than the longer ones. At 6,125 feet elevation, Baring Mountain is not the highest peak in Washington, but it does merit distinction in that it is one of the steepest. A ridge along the northwest edge of this rugged mountain is the most used access route to the summit, although a much more difficult, but rarely used, route along the southern peak, is also established. The dramatic overhang of Baring’s peak is imposing as it looms over the land below, and the sheer cliffs at its head are visible for miles away. This seldom climbed mountain is often compared with the climbs at Yosemite, except that the rock has a reputation for being loose and rotten. Climbers should take great care when attempting to summit Baring Mountain. Bonanza Peak makes for a wicked climb in the North Cascades of Washington. It’s not the most technically difficult of any of the mountains on this list, but it does require a wide variety of skills, from glacier crossing to steep rock climbing, scrambling, and crevasse navigation. This obstacle course of a mountain beckons true mountaineers wishing to challenge their skills, and the resulting hike is one that should allow hikers to feel confident tackling almost any other mountain in the country. To reach Bonanza Peak, visitors can take the Lady of the Lake Ferry to Lucerne, where they will find the trailhead. 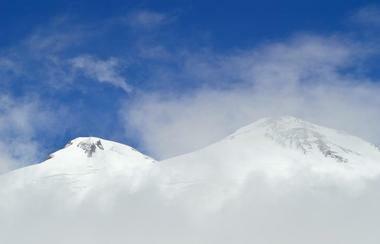 Mount Logan is home to three glaciers and most routes to the summit will require a trip across one or more of them. At the top of the mountain, visitors should expect a Class 4 climb to the summit rock. It’s a remote peak and surrounded by a small cluster of other remote peaks – Buckner, Storm King, Goode, and Black – so that hikers sometimes attempt all of these mountains in the same loop. The hike to the top of Mount Logan usually takes about 3 to 4 days, and the quickest ascent, via the Douglas Glacier, is one of the most difficult, so most hikers use the Fremont Glacier as their standard approach. Although the view from atop any mountain tends to be beautiful, with sweeping panoramas of jagged landscapes far below, many consider the view from the summit of Luna Peak to be the best view in the state of Washington. Located within North Cascades National Park, Luna Peak is rugged and remote, a true reminder of the vast wilderness that lurks just beyond the reaches of human civilization. The summit offers views of lakes, forests, and mountains for miles, and the hike to the top reaches Class 2 or 3 at its most difficult. 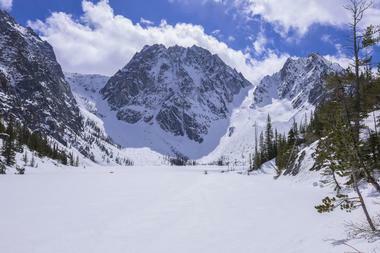 With a prominence of 2,560 feet and a blanket of snow over it for most of the year, Red Peak is a fun peak to summit, either by hiking or in snowshoes. 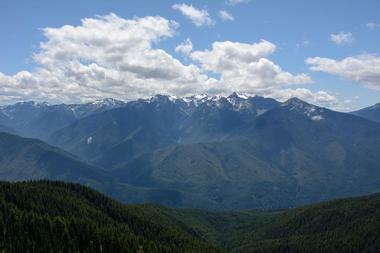 There are several peaks in Washington by this name, but Red Peak, located near Cle Elum, is the better known of them. The trail length to the summit is about 3 miles, making it one of the shorter hikes on this list, with an elevation gain of about 3,200 feet. There are campgrounds near Red Mountain but due to its short length, summiting this peak should only take part of one day. Mount Fury is an extremely remote mountain in the Northern Pickets, and the journey to the top of this mountain is long in both time and distance. With two peaks of equal elevation, summiting the second after the first will take a full extra day, but the views from each of these summits, of snow capped rocky peaks framed by blue skies, make everything completely worth it. 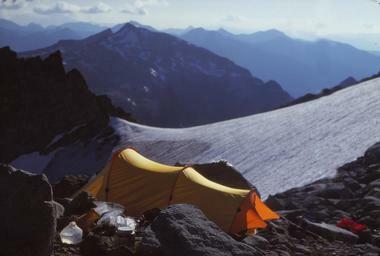 Camping on Mount Fury is possible and easy in a few established sites, but campers should be aware of any number of small animals on the mountain that may be interested in their food. Old Snowy is a popular mountain within the Goat Rocks Range, with a summit that is quite close to the famous Pacific Crest Trail, which extends for over 2,500 miles across the West Coast of the US. The trail will lead through meadows and vast patches of wildflowers to the snowy summit, where hikers can expect to find stunning views of Mount Rainier, Adams, and Saint Helens, as well as the other peaks of the Goat Rocks. Advanced mountaineers can even find a route from the summit of Old Snowy over to the neighboring Ives Peak. Unicorn Peak is named for the tall spire of rock that extends from its top, much like the horn of a certain mythical creature. Coming in at 6,971 feet elevation, Unicorn Peak is a mountain that requires some Class 5 climbing to summit, but this shouldn’t deter beginners. Unicorn Peak is actually well known as an easy peak for amateur climbers to learn on, so long as they have an experienced climber there to lead and show them the way. There are several different routes to the summit, and from the top, climbers can expect a spectacular view of Mount Rainier. The summit of Purcell Mountain used to be home to a watchtower, until it was torn down during the 1950s, but evidence of the tall structure still can be found at the top of this peak. Also easily spotted from the summit are patches of the mountain that have been heavily logged over the past decade or two, which give extra visibility to a landscape that is already breathtaking. Purcell is not difficult to summit, and it is a good hike for a beginner looking for an introduction to mountain hiking.